Rich land at the edge of a great prairie with the wonderful Fox River flowing through it, providing a source of power-this is what the settlers of Kane County found when they arrived. Early pioneers came from the eastern United States in the 1830s, and later migrated from Europe. Kane County in Vintage Postcards tells the story of the beginning of Kane County through its first 100 years, 1838 through 1938, featuring images of that period. 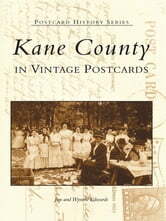 This new history of Kane County includes an essay on the importance of postcards as historical data, a general history of the county, and a section-by-section look at 27 cities and villages. More than 200 pictures and colorful narratives tell of the accomplishments by those first few generations who lived and died in the county.